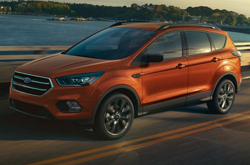 While there are numerous compact crossover SUV models available for you to choose from this year, you may find it difficult to find a vehicle that offers more value than the 2019 Ford Escape. This model was originally launched in 2000, and the new model is in the line's third generation. As you look at what the new Escape offers, you will find that many of its features and design elements carry up from last year's model. However, there are a few feature updates that you need to know about. In the Titanium trim, you will find an improved navigation system. In the SE and SEL trims, a remote keyless ignition feature is standard. 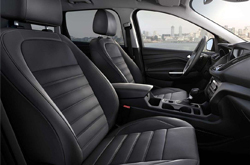 Because last year's model was so well-designed, you will find that many of the same equipment and features from that model are also found in the 2019 Escape. Because all four of the 2019 trims are designed with impressive features, you may find it difficult to decide which one to take home. The trims for 2019 are the S, SE, SEL and Titanium. If you opt for the base trim, your Escape S will be equipped with steering wheel-mounted audio and cruise control buttons, a manual liftgate for easy access to the cargo area, an infotainment feature with voice recognition, a body-colored rear spoiler, a trip computer, single-zone climate control, power door locks in the front and rear, blue ambient lighting throughout the interior and more. 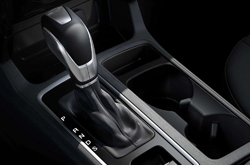 If you prefer to take home the top trim, your 2019 Ford Escape Titanium will come with a leather gear-shift knob, an auto-dimming rearview mirror, a leather heated steering wheel, a hands-free power liftgate, leather interior, powered adjustable front seats, a push-button starter, a dual-zone climate control system, an optional power sunroof, parking assistance, upgraded wheels and tires, SiriusXM radio and a few other standard features. Finding a vehicle that you enjoy cruising around in may be a top priority, and you will not be disappointed by the Escape driving experience. 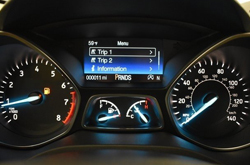 Some of the many well-designed mechanical features that impact your time behind the wheel include braking assistance, stability control, anti-lock brakes, a SelectShift automatic transmission, an optional engine block heater, a rear and front suspension, a parking brake, curve control, stability management, advanced traction control and a few other mechanical features. Powertrain options vary by trim. The standard powertrain in the S trim is an IVCT, I4, 2.5-liter powertrain. At the highest end of the spectrum, the Titanium trim is loaded with a Turbo 2.0-liter, Twin Scroll engine. How Will the Ford Escape Keep Me Safe? Regardless of whether you plan to use your 2019 Escape as a family car, a commuter vehicle, or something else, the desire to stay safe may be strong. Ford is known for incorporating quality safety features in its vehicles, and this holds true for the 2019 Escape. Some of the standard or optional features available in the Escape include automatic high beams, puddle lights, advanced airbags with dual-stage technology, a canopy overhead airbag, a rear-view camera, and post-crash alert feature. With so many options to choose from we encourage you to visit us to get behind the wheel. Experience the capabilities of the 2019 Ford Escape for yourself with a test drive with us at Westway Ford.